How a 3-5-2 might save Blackpool from relegation? Wigan Athletic had just gone 3-0 up at Bloomfield Road, only minutes earlier Ian Holloway had made a treble substitution in order to salvage something from the game, with three goals needed Holloway had a rethink. That rethink may just have saved Blackpool’s season, but why? Holloway shuffled his players and set them up in a 3-5-2 moving from their usual 4-2-3-1 / 4-3-3 shape. On the face of this, it might have been an act of desperation, however, on further inspection it appeared to be a shrewd move. By moving Neil Eardley from right back in to the centre of midfield, Blackpool still maintained a three-man central midfield, but the structure changed and it is this change of structure that sparked a recollection in the mind of Ian Holloway. Without knowing it (or perhaps he did know it), he had brought back the midfield set up that served Blackpool so well in the Championship, albeit flanked by two wingers or wing backs (depending on your interpretation). In this case however, that point is irrelevant. 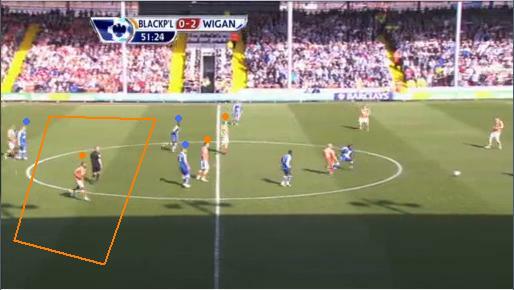 Showing Blackpool shuffling in to a 3-5-2 in front of Wigan's midfield. For the match against Wigan, Blackpool set up with their midfield three in a triangulated fashion as they’ve done for the majority of the season with the exception of maybe Spurs at home (more 4-1-2-3 then). The tip of the triangle is furthest up the pitch and that player looks to receive the ball in advanced positions before making passes out to the flanks and on occasion in to the channels beyond the opposition defence. This formation on a number of occasions has served Blackpool very well, especially against teams who set up in a standard 4-4-2. This means that the player (usually Elliot Grandin) will play in behind the opposition central midfield and in front of the defence and few teams, when he has played well, have picked him up effectively. However, against Wigan and in recent weeks, due to either a loss of form, recovery from injury, better opposition or a combination of all three, he has largely been ineffective. In fact Wigan cancelled out Blackpool by inverting their midfield triangle as demonstrated below. Wigan going man for man in midfield. You can see in the screen shot below how this played out in reality as Wigan closed down Adam and Vaughan denying them the space or the angle to make the pass to Grandin. Grandin has plenty of space, but Watson is ready to close down once Grandin gets the ball. Wigan midfield (blue) closing down Vaughan and Adam in the centre. Grandin free and has that space to roam in, however, Watson (blue) is deep and waiting, but it would be difficult form Adam and Vaughan to get through their counterparts. When Blackpool played Fulham at Craven Cottage Blackpool saw plenty of ball in the centre of the pitch but rarely got the ball through to Grandin because of the hard work put in by Danny Murphy and Dickson Etuhu. When Grandin saw the ball his touches lacked quality, fluency and sharpness. The Fulham game was a warning that went unheeded. Against Wigan a bland and ineffective first 73 minutes meant a change was needed. When the switch to 3-5-2 was made Grandin had already been withdrawn. Earlier in the game, he again had been poor. Wigan, setting up with a four banded system, filled the space in front of the defence denying the space for Grandin to work in. Wigan effectively cancelled out Blackpool’s shape and worked harder off the ball to press Blackpool and forced them in to making errors. The 3-5-2 flattened Blackpool’s shape in midfield and they began to control the game, whether this was more down to the game situation of Wigan being three goals to the good is hard to say. However, Neil Eardley looked assured on the ball, gave bite in the tackle and made up for the absence of David Vaughan. Keith Southern worked the right hand side of the three and Charlie Adam the left. All of a sudden Wigan’s formation was out of step and Blackpool could over run Wigan’s more advanced midfielders and make runs from deep that were hard to track. At that moment Ian Holloway had regained the qualities of his Championship midfield. You can see how the Blackpool midfield set up in the 3-5-2 and the runs they were able to make putting stress on Wigan’s deeper midfielder who had to watch and track runs from deep. Flattened out and breaking out. 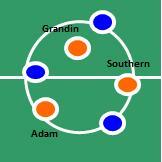 The Championship midfield was fluid, Adam, Vaughan and Southern rotating position, all getting on the ball at different stages and different positions, covering for each other, making untracked runs from deep, working midfield passing triangles getting the opposition to chase and pulled out of shape. This is essentially what Ian Holloway reverted to against Newcastle, inspired by the shape within the 3-5-2 he pulled his Championship triumvirate back in to the game in his tried and tested 4-3-3. It’s important to understand why Blackpool had changed their midfield set up for their Premier League campaign as it wasn’t necessarily by design. A pre-season injury to Keith Southern left Ian Holloway with a selection dilemma, Elliot Grandin had been brought in (presumably) as a winger/wide forward, but given Southern’s injury, thrust Grandin in to the role. The thumping of Wigan on the first day of the season would have given Holloway heart and little reason to change and from there on, the selection stuck. Once Southern regained fitness and looked like becoming a starter, he struggled to find his form in the Premier League, possibly due to lack of game time, but more so, perhaps because of the change of midfield shape and the changing of expectations of the midfield role. Against Newcastle he seemed more assured in familiar company, as if he knew what to do and where to go, statistically he probably had his best game (winning 6 tackles against his season average of 1.5) and the important aspect is the fact that all three midfielders know when to cover each other. Previously had Southern played with Grandin in the side, if he has pressed high up the pitch and been taken out with a good pass or two, with Grandin also being advanced that Blackpool had two men out of the game. With this system, he knows he can go to the man on the ball as there will be two behind him, and should Adam press high up, then he’ll drop back and cover. Against Newcastle’s two central midfielders Blackpool bossed them through sheer weight in numbers, but also better use of the ball. However, had the triangulated shape been in practice and Nolan and Tiote may well have shut Grandin out and given Newcastle the advantage. However, it was rare that they could do this with the flatter Blackpool midfield, time and space were restricted and once Blackpool gained possession they had good passing angles and great midfield running that more than once threatened to open Newcastle up. Effectively Ian Holloway has made subtle midfield changes to gain better control of the centre from teams who know what to expect from Blackpool. Earlier in the season few teams closed them down and very few paid special attention to Charlie Adam, giving him acres of space to play in. Given the turn of the year, teams have started to focus on Adam and working hard in the centre of midfield to sit narrow and close out the passing angles to Grandin. This effectively strangled Blackpool and in combination with a few games strewn with poor forward movement and defensive errors largely explains why Blackpool have gone so long without getting wins. Given that Stoke and Bolton, two proponents of the 4-4-2 are next up at Bloomfield Road it will be interesting to see how they cope with the change of shape knowing that their two central midfielders will be outnumbered in a slightly different way than they were earlier on in the season. A much improved Blackpool team worked hard and dominated Newcastle for large parts of the game as the Tangerines gained another Premier League point. An early strike by Peter Lovenkrands was cancelled out by a DJ Campbell flick, but in truth Blackpool had the better chances and would’ve hoped to have converted again to secure the three points. 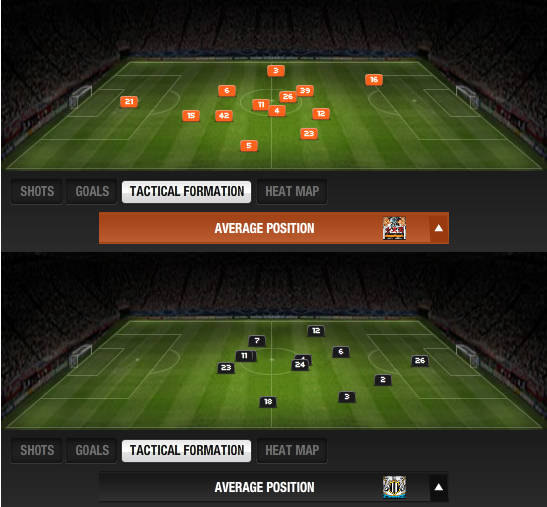 Newcastle's 4-4-2 with Barton sitting in narrow matching up against Blackpool's 4-3-3. 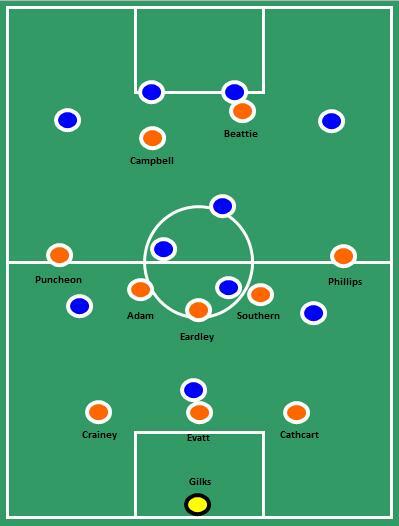 This match saw Blackpool’s 4-3-3 go up against Newcastle’s 4-4-2, but as will be noted later on, it wasn’t a straight forward 4-4-2. Ian Holloway brought Matthew Phillips in to his attack and David Vaughan returned in to the centre of midfield, whilst Alex Baptiste took over from Craig Cathcart in the centre of defence. Although DJ Campbell started on the left of the attack, as usual the front three interchanged positions throughout the game, Campbell generally being better through the middle. Newcastle brought Kevin Nolan in to the centre of midfield after his suspension. Earlier in the season Blackpool had enjoyed good success against teams playing regular 4-4-2 as Elliot Grandin as the central midfielder in a 4-2-3-1 was able to drift in to the space between the opposition midfield and defence. Here Ian Holloway rolled out his Championship midfield triumvirate who appear to hold a much flatter field position, but subtly rotate attacking and defensive roles. It was a fluidity that perplexed many Championship teams last year and in this match it appeared to spark in to life again. Newcastle on the other hand covered the space in front of their defence that Blackpool like to exploit by getting Cheik Tiote to sit deeper than Kevin Nolan in the centre of midfield. Jonas Gutierrez was told to stretch the width of the pitch on the left-wing, whilst Joey Barton sat much narrower in-field on the right, presumably to deny the space afforded to Blackpool’s midfield in order to help Newcastle control that area of the pitch. In truth this never seemed to work as Barton appeared to be off the pace of the game and was physically dominated at times by Keith Southern and Charlie Adam. This also left plenty of space wide on the left that allowed Stephen Crainey to attack from left back and put in a couple of dangerous crosses and passes in the final third. Newcastle defended deep but in truth Blackpool did dominate the possession in the game. When in possession it appeared that Newcastle either by design or by consequence of their own strength focused their play down their left. Other recent Blackpool opponents have taken the same approach deliberately, as a key perceived weakness of Blackpool is the right back area. You can see below where Newcastle attempted the majority of their duels, notice how many they lost wide left and in the middle and final third. 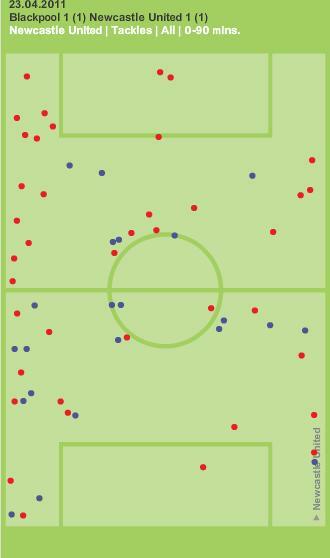 The string of red dots on the left wing showed that if Newcastle did target that area, then they enjoyed little success. In fact Newcastle lost the battle of duels only winning 22 out of 62 challenges. This proved pivotal as Blackpool were strong on the ground and in the air winning 16 more challenges to clock up 38 out of 61 successes. This will have been from the fielding of the flatter midfield three in combination with the relentless pressing that Blackpool applied to keep Newcastle under pressure. In recent weeks Blackpool triangulated midfield has been thwarted by stern opposition midfield, but also by poor play by Elliot Grandin. It is vital in the triangular version of Blackpool’s system that the player at the tip of the triangle moves effectively to find space and then is efficient with his distribution to link up with the forward line. 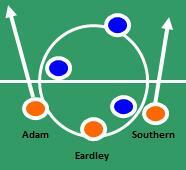 When this fails to happen the player becomes isolated and effectively Blackpool become a two-man central midfield. 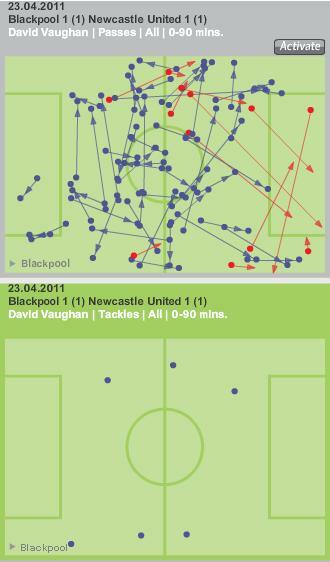 Having David Vaughan back in the side, not only gave Blackpool more passing stability and reliability, but he came back tackling as tenacious as ever and made surging runs from deep midfield that Newcastle on occasion found difficult to track. Should he remain fit for the last four games then Blackpool will take this relegation battle down to the wire. You can see below how his steady passing was complimented by him winning 6 out of 6 of his duels. All round midfield performance from David Vaughan. Blackpool’s defence has been inconsistent all season long, however, at the heart of that defence is Ian Evatt, who turned in a solid defensive display yesterday. However, it was his timed runs from defence as well as his passing that really caught the eye. By breaking from the back Newcastle (already struggling against numerical weakness) were overloaded and Evatt drove in to the final third and triggered moves that led to chances for Blackpool. Look at his passing chalkboard below and you can see how he progresses right in to the final third. Another dimension to Blackpool's play as Ian Evatt steps out of defence. Even though Newcastle at times struggled to gain a foothold in this game, they did carry a threat going forward when they had the ball. Enrique and Gutierrez were direct with their running and worked hard to get the ball in to the right areas for their forwards. However, it was Ameobi who struggled to find his feet, quite literally early in the game as he inexplicably lost his footing when a scoring opportunity beckoned. Aerially he performed solidly, but when acting as a platform for Newcastle to build attacks on, all too often he failed to link up with a team-mate. You can see how many mis-placed passes there are on his chalkboard below. Linking the play was a trouble for Ameobi with too many red streaks here leading to plays breaking down. Newcastle seemed content with seeing out the game as the last ten minutes came on the clock, they are safe for another season of Premier League football and that might have showed a little. Moving in to next season they clearly have a stable base on which to build. Cheik Tiote provides a lovely balance for their midfield and Enrique breaks with purpose from the back. However, the holding and link up play up front will need to be much better should Alan Pardew stick with the same system. Ian Holloway on the other hand will be much happier to see his ‘old’ midfield trio find their feet for the first time in a Premier League match and should they progress and dominate other midfields like they did here then maybe Blackpool will defy the odds and stay up. A feature of Blackpool’s football under Ian Holloway has been the quick tap free kick as they start another passing sequence instead of a clogging of a high ball forward deep in to the opposition half. When Craig Cathcart made an error in gifting a quickly taken free kick to Wigan in the run up to their opening goal, not only were Blackpool on their way to a 3-1 defeat, but it encapsulated where Blackpool may have been going wrong of late. ‘We had a set-piece in the middle of the pitch and I’m sat in the dugout expecting us to wait till we get our big men forward, then hit a high ball into the box and put our opponents under pressure’. This seems a rather odd statement from Holloway given his penchant for passing football. It sounds very much like he wants to get the ball in the box and work things out from there, not a very sophisticated approach. Cathcart can be blamed for such a poor pass in gifting Wigan the lead, but at the heart of that he is caught between two minds, two philosophies and one of them just doesn’t resonate with Blackpool. It would appear that Ian Holloway has been working on long ball free kicks as a clear set piece, usually involving Ian Evatt taking up a position in the opposition box whilst Charlie Adam delivers the high free kick. 1. 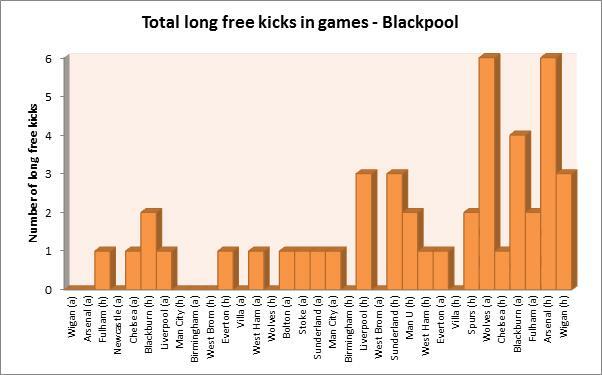 Have Blackpool taken more long free kicks over recent weeks? 2. 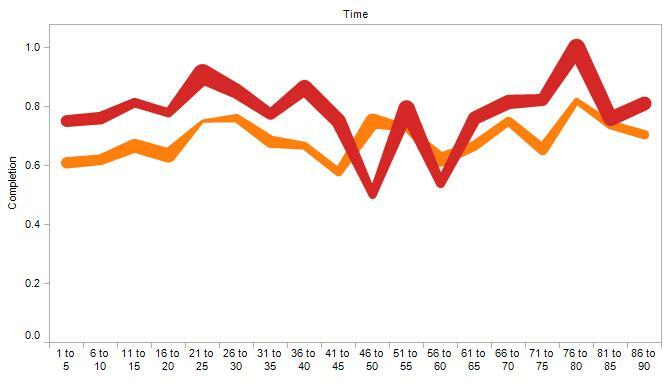 What is the impact of a long free kick on Blackpool’s matches? In order to establish if Blackpool are taking more longer free kicks, each free kick they’ve taken this season has been looked at and characterised in to short, long in to the box and other. In doing so the following pattern emerged. Going long more often as the season progresses. As you can see the number of long free kicks* that Blackpool have taken over the course of the season has grown and grown. As an observer, the Liverpool game appeared to be the first time that Blackpool consciously halted play prior to the taking of a free kick so that Ian Evatt could take up his position in the box. It may have always been a part of Blackpool’s game plan, but it was the Liverpool game that made it appear more pronounced and the statistics seems to back that up. In fact in the last four games Blackpool have 15 attempted long free kicks, to put that in to perspective it took them twenty-two games to amount that many from the start of the season. To further back up this increased long approach the % of free kicks hit long prior to the Liverpool game averaged out at 8% and has risen to 25% since then. So Blackpool are going long from their free kicks which is not an issue on the face of it as many teams employ this approach. It gives you territorial advantage, a chance to pick up a knock down, a chance to score, a chance to build play in the final third. All of these are valid reasons for doing so, however, there’s something not right about this when it comes to Blackpool. It flies in the face of Holloway’s philosophy of short passing, but tactically it is a decision he has made and clearly now expects. Perhaps it grew from the fact that Blackpool started to score goals from set pieces, more than any other team in the Premier League prior to the Aston Villa game back in February. In fact the winning goal against Liverpool came from a high ball (not a free kick) in to the box which Ian Evatt knocked back for DJ Campbell to score. What this approach also does is make a poor defence even poorer due to the removal of a key defensive player. A centre back going up for a corner can always be a risk, but cover is always provided. A free kick will mean that Blackpool will almost double the amount of times they need to provide defensive cover. Just a quick glance at the second goal that Sunderland scored at Bloomfield Road gives you the perfect example of where this risk has been punished. Teams in the Premier League spend hours rehearsing what they will do in transition as their defence turns in to attack. Blackpool are poor in their attack to defence transition and this has been exploited time after time by clinical teams this season. Whilst Ian Holloway might be intending to do the right thing with long free kicks, it may well be weakening his side leaving them exposed to attack and in possession of the ball for less time. If Blackpool continue this long approach then they will be hoping that it helps them win games, at the moment that case seems to be some distance off and in fact Blackpool may well have start to taking short free kicks again to build play and also to give them more defensive assurance. However, should their long free kicks persist then they best be working on getting their shape back quickly as you can be sure that every manager between now and the end of the season will be working very hard to exploit Blackpool in transition passages of play. *For the purposes of this article a long free kick was defined as a free kick that is taken from the defensive and middle thirds, landing in to the opponents penalty area. Wigan took the points as they turned in a composed performance, taking advantage of chances handed to them by Blackpool. Blackpool on the other hand will want to forget this error strewn match as Ian Holloway continues his search for a settled first eleven. The team selection for Blackpool centred on the return of Matt Gilks in goal and the restoration of Neil Eardley at right back with Elliot Grandin coming in to the midfield. For Blackpool the problem from the Arsenal game remained how to compensate for the loss of David Vaughan. In truth no one really covered his position providing Blackpool with the same gap in their balance that caused them problems against Arsenal i.e. there’s not enough cover for the defence nor disruption of the opposition midfield. Wigan were somewhere between a 4-1-4-1 and a 4-5-1, with Steve Gohouri coming in for the suspended Maynor Figueroa. Roberto Martinez asked Ben Watson and James McCarthy to sit deeper than Mohamed Diame who appeared to be asked to play higher up the pitch. Presumably to apply pressure to Charlie Adam in the deep. Tactically the game itself was pretty plain from Blackpool’s perspective. Presumably the individual errors took away and coherency from their play and didn’t allow them to execute their game plan. One element that was clearly not apparent, which seemed obvious, was to target the left back Steve Gohouri who may have found an appearance at left back somewhat uncomfortable. However, it was Martinez who made the most distinctive tactical moves. Firstly, as mentioned above, stationing Diame higher up the pitch to pressurise Charlie Adam and deny him the space that he thrives on. The other tactical element that Martinez appeared to bring to the game was to focus Wigan’s play down their left flank. Blackpool’s right back area is one of concern for Ian Holloway and his constant switching between Eardley and Alex Baptiste shows his doubt about the position. 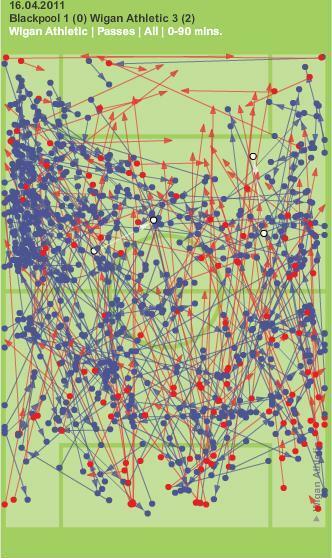 Whilst Wigan didn’t really get a lot of joy down the left, they were confident on passing the ball about in that zone of the pitch, Tom Cleverley, N’Zogbia and Diame all focused their passing and running in to that area and that can be seen in the high concentration of passes on the chalkboard below. The major piece of tactical intrigue from Ian Holloway came when the game was dead, therefore the value of his change must be tempered by that fact, however, it is well worth noting what he tried. After his triple substitution failed to change the game within his normal framework he pushed Neil Eardley in to central midfield turning Blackpool in to a 3-5-2. Arguably Blackpool’s system has been exposed in recent weeks as the player at the tip of the midfield triangle has either been squeezed out of play by the opposition or the player hasn’t played well. If either of these or both happen then Blackpool’s system becomes more predictable. The shift to a 3-5-3 flattened the midfield three bringing in Eardley who is more competent on the ball in to the area of the pitch that Blackpool had surrendered to Wigan through poor displays from Keith Southern and Charlie Adam. 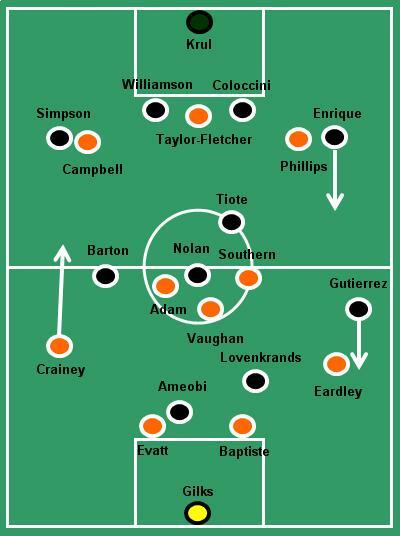 The shift to this system gave Blackpool more control and composure in the centre. Whether this system would work elsewhere isn’t clear, what is clear is that Neil Eardley could well play more games in the centre of midfield and this is something that has been toyed with for a while as Holloway tried him in central midfield during pre-season. Another point to note is that while Charlie Adam is heading to the PFA Awards he will be left to reflect on a game where he was outplayed by Ben Watson. 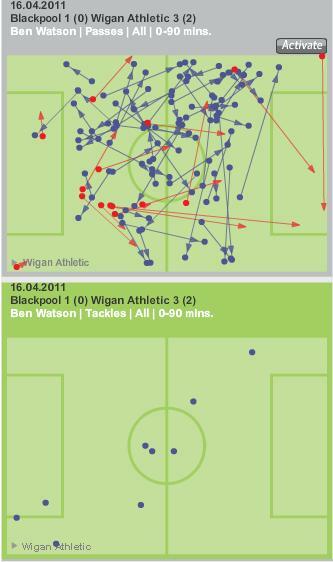 Watson dominated the centre of the pitch winning all 9 of his duels, passing efficiently and breaking up play with 4 interceptions. Wigan gained control of the centre through Ben Watson. 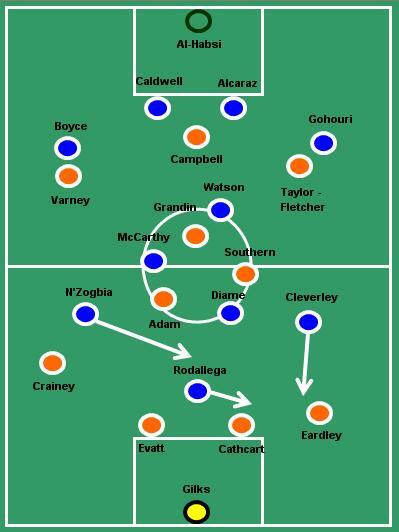 Charlie Adam was wasteful and Ben Watson showed how to retain possession and stringing his side together. However, as individual performances go Tom Cleveley was safe in possession and Charles N’Zogbia showed the direct running and link up play that make him a very dangerous player when he wants to be. The final point to make is that without David Vaughan Blackpool are even weaker in defensive passages of play and struggle to break up the opposition. 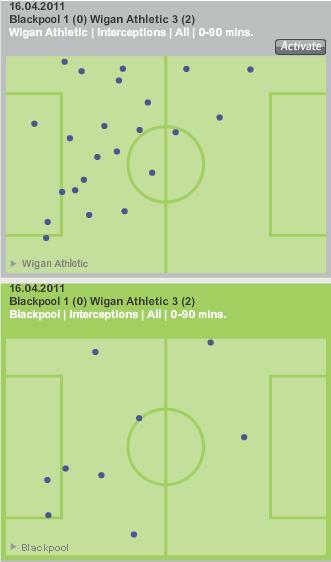 Wigan were superb in their passing, but also superb in breaking up Blackpool’s play with 19 interceptions. Blackpool’s error will have contributed to this, but Blackpool had no answer to this only being able to make 9 interceptions themselves. No contest. A fine smattering versus a splutter. Blackpool need to be much better off and on the ball in their final few games working harder to disrupt teams as well as cutting out errors and recovering better from those that they make. Wigan will be happy with three points, but they will have harder tests than this and will need Ben Watson, Charles N’Zogbia and Tom Cleverley to keep building play in the final third order to threaten better teams. Six games to go and not surprisingly the relegation picture has changed quite significantly since my first look at the run-in. Four games ago I believed that eight sides were involved in the relegation battle. Of those teams, I was bold enough to condemn both Wigan and West Brom to the drop, being undecided about the third club who may join them in the Championship. While Wigan are very much still involved – indeed they currently sit rock bottom – West Brom, no doubt just to spite me, have confounded all expectations and probably secured safety with half a dozen games still to go. Another team I’d factored into my original analysis was Fulham but a few decent results, including a win over the Seasiders, has seen them open up a bit of a gap to the bottom three. This leaves six sides who I believe will be battling between themselves to escape relegation. That’s not to say a different side will not plunge into the mix, as anyone from Newcastle (currently 9th) down may still require the odd point here and there to survive, but you’d think it would take a really poor run of results for one of them to sink. Let’s take a look at the home and away fixtures for those sides who are in most danger at the moment. Most striking in the above table are the imbalances in symmetry. Namely the game in hand for Birmingham, four home matches for Blackpool and four away fixtures for Wigan. However, before we get on to other sides’ fixtures, we’ll once more focus firstly on the Seasiders. Home Is Where The Points Are For Blackpool? It surely goes without saying that if ‘Pool are to survive, they will have to perform at Bloomfield Road. A great deal has been made in the media of Blackpool being a much better away side than at home, but it’s not a view I necessarily buy into. While the Seasiders have picked up slightly more points away from home – 18 as opposed to 15 – the points per game difference in negligible – 1.05 away in comparison to exactly 1 at home. In addition, whereas ‘Pool have sometimes capitulated on the road (Arsenal, Chelsea and Fulham to name just three), there have been very few home games in which the Seasiders have not competed (only West Ham and Birmingham instantly spring to mind). In fact Blackpool have been very unlucky to only have won four games at Bloomfield Road. When you consider that the remaining home fixtures are also far easier on paper than the daunting trips to White Hart Lane and Old Trafford you can see this so-called superior away record is largely a myth. The first game up against the Latics is likely to set the tone for the remainder of the run-in. A victory for ‘Pool will raise spirits and build a solid foundation for the home games to come. A draw, or worse still a defeat will only increase the pressure on Ian Holloway’s side. After this follows the visit of a Newcastle side with little to play for, and then home matches with Stoke and Bolton, one of which will definitely have their minds elsewhere on a cup final. One has to think that a minimum of six points will be required from the four home games, if not slightly more. It’s certainly achievable, but you get the feeling the outcome of the Wigan match could be decisive. Both Blackburn and Birmingham currently have a three point cushion to the relegation zone, but this is by no means of any comfort to their supporters. For all that has been made of the Seasiders’ poor run of results, Blackburn have fared even worse in the last eight games, failing to win any of those, scoring only nine goals in the process. Two tough home matches against the blue and red halves of Manchester sandwich a local derby against Bolton – hardly the ideal set of fixtures for a team that has scored over two thirds of its points at Ewood Park. Away from home Blackburn must face a resurgent Everton, followed by two massive six pointers against relegation rivals Wolves and West Ham. It’s hard to see how Blackburn can reverse their downward momentum, but based on their current points tally, four or more points from those last two away games could be enough to save them while condemning the opposition to the Championship. In contrast, Birmingham will be targeting their games at St Andrews as the ones to rescue their season. Their next home game sees them take on a crisis-stricken Sunderland, while the other two home ties see them pitched up against notoriously bad travellers Wolves and Fulham. Should they fail to capitalise on these home fixtures though, the away games look anything but easy and it’s hard to envisage them getting much return on these four matches. Bottom Three – Cut Adrift? The three Ws who currently occupy the relegation places have varying prospects. Bottom side Wigan must play four of their remaining six games away from the DW Stadium, leaving them in an uphill struggle. On the plus side, none of their final set of fixtures come against top six opposition, but ultimately they have the most ground to make up and they realistically have to win at least half of their remaining games to stand a chance – a big ask for a club that has not won back-to-back games all season. Back-to-back wins for West Ham over Liverpool and Stoke back in late February / early March looked to have buoyed the Hammers, but with only one point from a possible nine, they have been sucked right back into the scrap. The signing of Demba Ba, combined with the return to fitness of Thomas Hitzlsperger reinvigorated Avram Grant’s men, but it was not enough to steer them clear of trouble. The Irons will hope to take advantage of some kind home fixtures, but of their away games only Wigan looks like one from which they could get something. Last but not least we come to Wolves. Mick McCarthy’s side have rightly won plaudits for the way they have played this season, especially against the top teams, including memorably taking the scalp of the previously unbeaten Manchester United. Failure to convert these performances into results against lower half opposition has left them vulnerable however, and a confidence-sapping 3-0 home defeat to Everton last week has put them in a precarious situation. Wolves’ fixtures, home and away, don’t seem to be that threatening, but these are precisely the games they have found difficult. Wigan will be relegated – Ok, so this is hardly an inventive pick, but as the current bottom side they will surely have too much distance to make up bearing in mind their dearth of home games. A win for the Latics at Bloomfield Road tomorrow though could change everything. Conversely, if they don’t win at Blackpool, it’s tough to see any way back for them. Birmingham will survive – Despite the horrible away games they have to endure, they could take a giant leap towards safety tomorrow against a depleted and out-of-form Sunderland. Two other home games that also look kind on paper, as well as a headstart on the bottom three should see them safe. 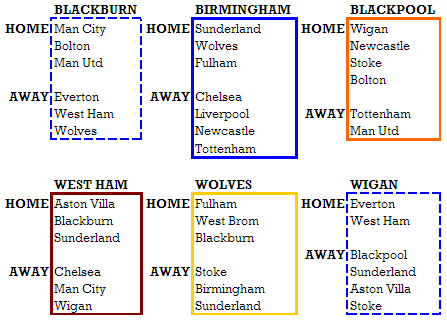 Blackburn will occupy a relegation spot at some point – I’m not convinced Blackburn will be relegated, but I can see their season hinging on the games at West Ham and Wolves which fall towards the end of the season. They may have to win these games to lift themselves to safety. Molineux will be the scene of last day relegation drama – A final day showdown between Wolves and Blackburn already seems to be an appetising prospect. The chances of both sides being safe before this game are slim, and it is likely one of them will say goodbye to the Premier League at Molineux on 22nd May. I’m sure these views will change as the weeks go by, but I’m confident that at least three of the above will come true. What about the Seasiders though? With more than a hint of bias, I do genuinely believe that Blackpool will stay up. It may well be heart ruling head, but the upcoming home games give Holloway and his team a superb opportunity to retain Premier League status. That said, defeat to Wigan tomorrow, while not catastrophic, would be worrying. The next month or so is likely to result in an outbreak of insomnia, one suspects. 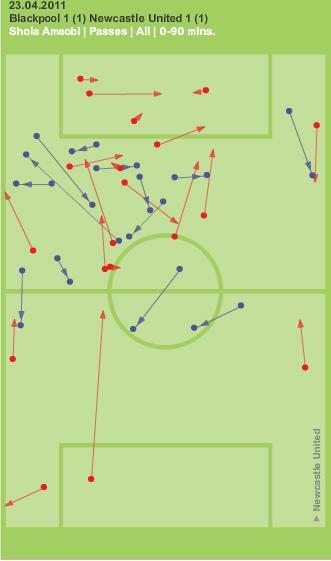 The tactical elements of this game were covered very succinctly over on Zonal Marking, so this post is a brief look at the passing stats of the game and using them to back up the narrative set down by Zonal Marking. Blackpool started brightly without ever troubling Arsenal who went on to score two goals before half-time. After half time Blackpool came out fast and worked hard and troubled Arsenal. Blackpool scored, then Arsenal reasserted their dominance scoring a third goal to put the game out of reach. 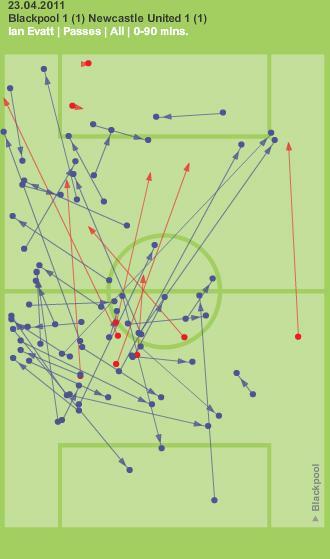 If you look at the pass completions of both sides and plot them on a graph against the time of the match does this show up? Yes it does, is the simple answer. 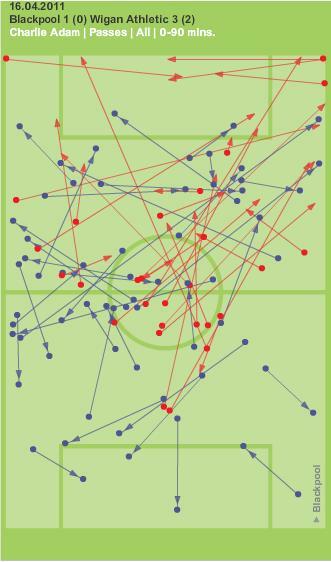 You can see for yourself that Arsenal dominate in the pass, completing more passes than Blackpool and at a higher completion rate, then half time comes along and the lines scramble as Arsenal fall apart and Blackpool come back in to the game. Then the pattern is restored. The other observation from the game centres around the lack of David Vaughan in the Blackpool side. This is something that Blackpool will have to cope with again in the game this Saturday and possibly for longer. Keith Southern came in to the side, a more recognised defensive minded midfielder. However, a replacement for David Vaughan he was not. Admittedly, a game against a team like Arsenal isn’t the best comparator, but Blackpool lacked midfield bite in the form of tackles on the ground and the interceptions that Vaughan contributes so effectively. Wait! The match stats show that Blackpool had 8 interceptions! That’s about par for the course you say (Blackpool have averaged 11 interceptions per game this season). The key here is how many occurred late on the game when the match was dead. Only 2 of those 8 occurred in the key period of the game. 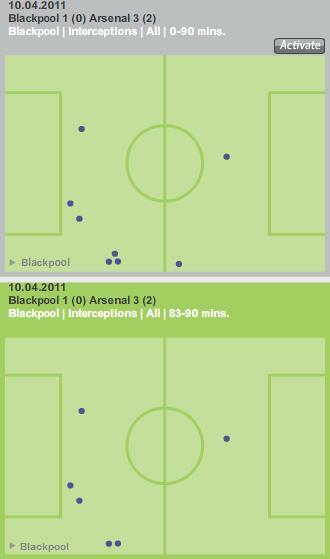 Arsenal in comparison intercepted Blackpool steadily throughout the game to record 24 in total. See the chalkboard below. Of Blackpools 8 match interceptions, 6 of them occurred in the last 7 mins. Also, looking at the tackle count, the team won 30 and lost 31 tackles, however, Vaughan’s replacement, Southern chipped in with only 1 won tackle (aerial) and Adam and Jason Puncheon who formed the rest of the midfield three chipped in with 2 and 2 respectively. Vaughan on average has won 4 tackles per match this season. A big gap in the Blackpool midfield that needs to be filled when Wigan take to the Bloomfield Road pitch on Saturday. Finally, if the interceptions and tackles don’t wash, then a quick glance at the first Arsenal goal (and the second to an extent) shows the absence of a midfielder tracking a midfield runner. Vaughan is usually so well positioned and as mentioned in a previous post, will track back to cover runs from the opposition midfield. Charlie Adam may well be going to the PFA awards dinner on Sunday, but the man on the treatment table holds the key to Blackpool’s survival in the Premier League. His level of performance has been exceptional, should Ian Holloway be to replace his industry and quality in his starting eleven then maybe the loss of Vaughan will not rock the boat too much. Fail to replace Vaughan and Blackpool will lose him forever (he is out of contract in the summer) as they face the new season in the Championship. *Credit to Graham MacAree from We Ain’t Got No History for his help on Tableau, check out his blog and follow him on Twitter.